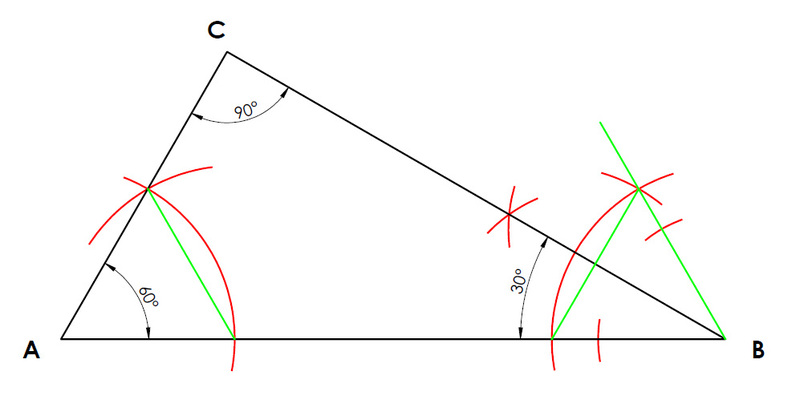 Constructing an A triangle containing 30, 60, 90 degrees given the hypotenuse. Since we are constructing a right angled triangle we know that the hypotenuse is always opposite the 90 degree angle. Next we construct a 60 angle at point A. (It does not necessarily have to be from point A it can just as easily be from point B.) If you are unsure of this step go to the Constructing a 60 degree line. Constructing a 60 degree angle. From the other end point of the hypotenuse we construct a 30 degree, simply by drawing a 60 degree line first and then bisecting the angle. see constucting a 30 degree line if you are unsure. Finally extend on the 60 and 30 degree lines that you are just after constructing and where they meet will automatically make a 90 degree line. 60 + 30 + 90 = 180 degrees. Therefore the construction is completed as required. the triangle contains a 30, 60, and 90 degree angle with the required hypotenuse. Since we are constructing a right angled triangle we know that any triangle constructed using the diameter and containing a point on the circumference is going to be a right angled triangle. We start off by drawing the hypotenuse of the given length and then bisecting it, giving us the midpoint. Construct a semi circle having line AB as the diameter. Next you could use your protractor and construct an angle of 60 degree from point A. Where this angle meets the semi circle gives you a new point C. Join point C back to point A to complete your triangle of 30, 60, 90 degrees. 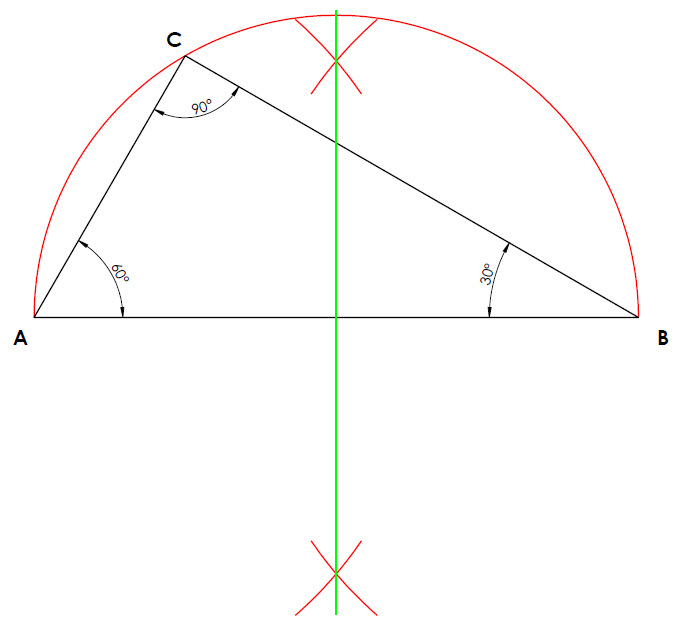 If you are told to show all constructions in the question (meaning you cannot use a protractor) then you simply construct a 60 degree line using you compass and straightedge. Drag point C to show that the angle will always remain 90 degrees. Move Point A or B to see no matter how big the diameter or angle the diameter is at, the angle opposite will still be 90 degrees.